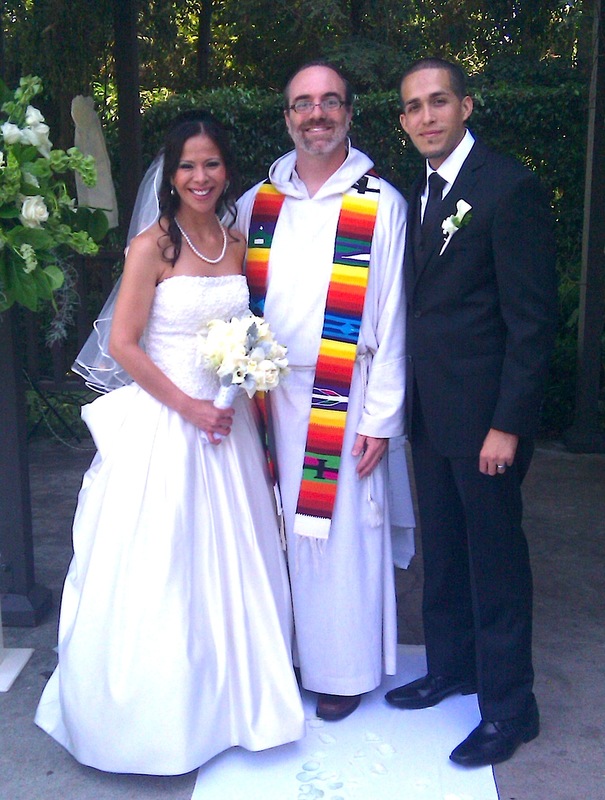 Blog | Los Angeles Wedding Officiant | Wedding officiant for Los Angeles-area weddings, from the offbeat to traditional, spiritual to non-religious. Hey folks, I’m separating my personal and professional Instagram accounts! You can now follow my working account instagram.com/wedbyjon. Hope to see you following me there! 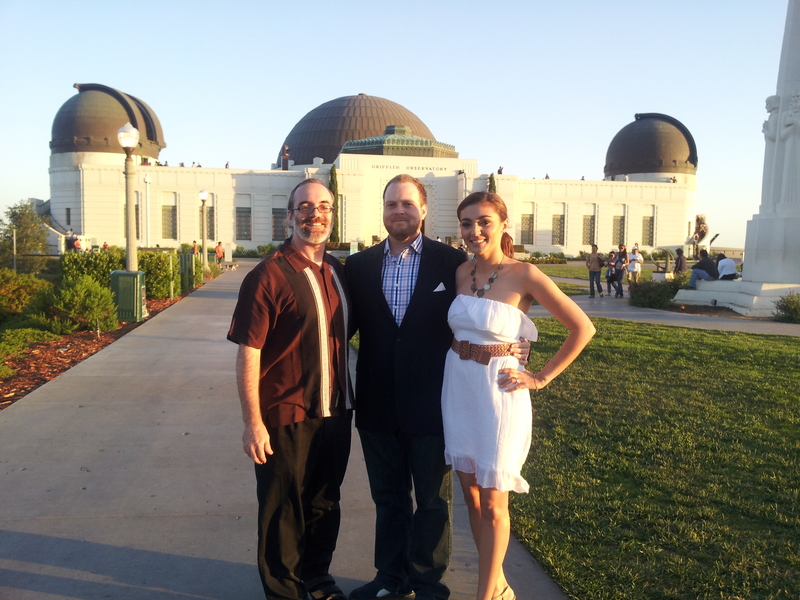 Also, I’d like to congratulate Yvonne and Richard on their fun ceremony yesterday atop the Los Angeles Athletic Club. What a beautiful couple and venue! Yvonne & Richard mingling with guests following their ceremony atop the Los Angeles Athletic Club. I’m so very happy that today, gay and lesbian weddings, with all the legal recognition they deserve, are resuming in California! It has been a long wait, but the wedding bells of love and justice are ringing again. I’m eagerly awaiting my first gay or lesbian couple to book me as their officiant, so spread the word to all your friends that you know a fabulous gay wedding officiant who would love to meet them! I was going through some old photos and came across this shot of David and Cristina Nava, taken almost two years ago! I recently had the honor of blessing their baby boy, Nicolas. I had a great time with the Navas back in 2011 and again this spring! I’m continually amazed at how lucky I am to be involved in families’ lives in such meaningful ways. The Altadena Town & Country Club was a beautiful venue. I highly recommend anyone consider it if you’re looking for a wonderful setting for your wedding. It has a lush garden lawn that was perfect for David and Cristina’s wedding and reception. I really enjoyed the violinist and cellist, friends of the couple, who provided the music for the ceremony. So elegant! You can read about Nico’s blessing here. Wedding planning takes many forms, from elopements to massive, detail-laden extravaganzas, and many levels in between. What really matters is that the couple is in love, ready to commit to each other, and that you have a few basics in place. Lia and Dana contacted me just a few days ago, asking if I was available for a their ceremony. With a few friends and relatives, the beautiful backdrop of Griffith Observatory, and a simple ceremony at sunset, Lia and Dana got married! I’m always honored by couples who ask me to officiate their ceremony, no matter how many frills are involved, and this was no different. Congratulations, Lia and Dana, and thanks so much for inviting me into your lives for this privilege. Wow, I just officiated my first baby naming and blessing! Baby Nico is the son of proud parents Cristina and David, whom I had the pleasure of marrying almost two years ago in Altadena. 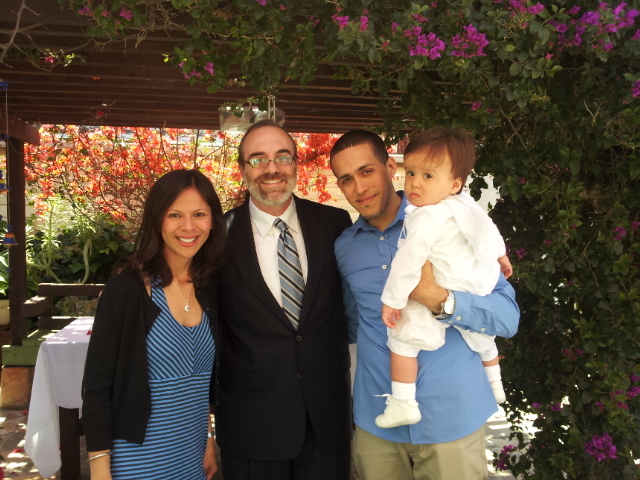 How wonderful to get to bless and name their baby today in a lovely cermony in Cristina’s parents’ backyard garden. about forty friends and family members gathered for the blessing. Indeed, we were all blessed by the love that was poured out today for Nico, his parents, godparents and all present. I’ll have to also recommend Tacos Mi Rincon Tapatio, the caterer. Delicious tacos, burritos, quesadillas and tamales! Matthew’s and Shannon’s artistic personalities were evident in the details of the day. Matt looked snappy in his black and white plaid shirt, and Shannon’s turquoise shoes were the perfect complement to her ivory dress. The ceremony was held on the Museum lawn in front of the church, which is still waiting on for an interior restoration. Simple white chairs graced the bright green grass, and an indigo sky was the canopy. Back at the reception area, white, yellow, and antique blue hues adorned the table settings, which included photos of the couple’s cats! While Matt and Shannon and the family did the wedding photo thing, the guests and I toured the three homes that have been restored. I was struck at how some of of the details in these Victorian beauties reminded me of some of the design elements in my Aunt Annie’s house in Birmingham, Alabama. Her house was nowhere near as opulent, but I could see that it was built in the same period. Noelle and Michael! 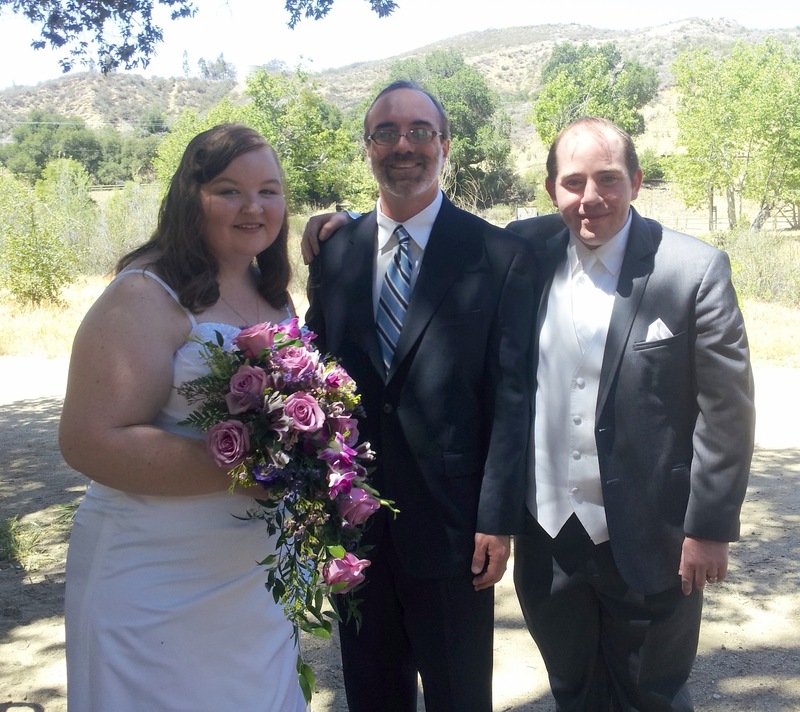 I was honored to be their wedding officiant today in the beautiful Placerita Canyon State Park in Newhall. We gathered under a huge, ancient oak tree for the ceremony which included “Storybook Love” from The Princess Bride, “The Day the Saucers Came” by Neil Gaiman, and beautiful personal vows that the bride and groom each wrote. The couple looked so happy together. 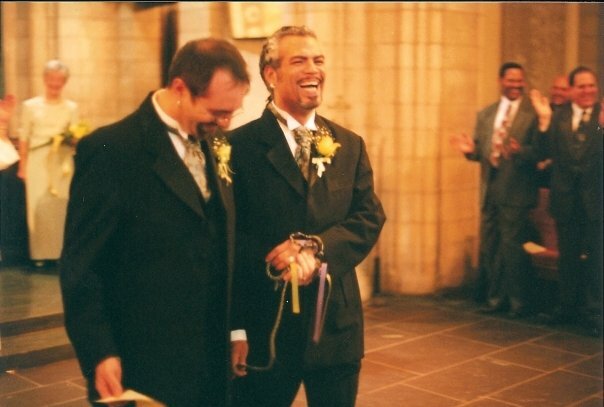 I’m truly a lucky weddding officiant, since I keep connecting with such great folks. I’m so glad I now know about Placerita Canyon State Park. It’s the location where the 1842 California Gold Rush began! I expected it to be super windy, but I think the valley protected us from the gusts. Highly recommended for anyone looking for an outdoor wedding venue for a smallish wedding. Most of the guests had seating on the benches under the tree, and the younger folk just stood. There’s a small nature center, museum and gift shop to peruse, as well as guided tours. A nice activity might be some guided tours for wedding guests while the wedding party takes photos after the ceremony and before the meal is served.